RBTH presents a selection of views from leading Russian media on international events, featuring analysis of the upcoming British general election, news of the resurgence of Nicolas Sarkozy on the French political scene, and a report on the continuing talks in Lausanne between the P5+1 and Iran on Tehran’s nuclear program. Business daily Kommersant reports that in Britain parliament has been dissolved, an indicator of the official start of the election campaign. The publication writes that Ed Miliband, the leader of the opposition Labour Party, currently ahead in the polls, has assured representatives of business that the referendum on an exit from the EU promised by Prime Minister David Cameron would be disastrous for the country. Cameron, meanwhile, has warned voters of the negative consequences of a potential Labour victory at the polls. Professor Tony Travers of the London School of Economics said in comments to Kommersant that foreign policy issues would barely be touched upon during the course of the election campaign. 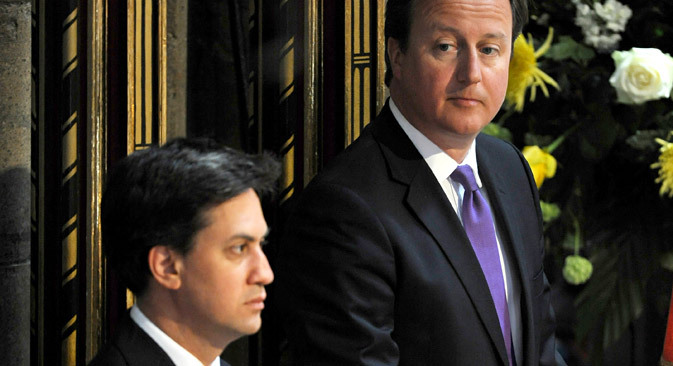 David Cameron’s stance on Russia is one of the toughest among EU nations, and Ed Miliband is not far behind. According to the newspaper, whatever happens, London’s position on relations with Moscow will not change significantly in the wake of the elections in May. The publication notes that the election campaign has already been dubbed the most unpredictable of the last decade – last week the Conservatives and Labour were practically neck and neck in opinion polls. It is possible that Britain may end up with a minority government led by Ed Miliband, writes Kommersant. Nezavisimaya Gazeta reports that the Union for a Popular Movement (UMP) has emerged victorious in local elections in France. UMP leader Nicolas Sarkozy labeled the defeat of the French Socialist Party as an expression of categorical disagreement with the policies of President Francois Hollande, writes the publication. By enlisting the support of voters from adjacent flanks, Sarkozy has made a strong case for himself as leader of the French opposition with a clear claim to the presidency, writes Nezavisimaya Gazeta. According to Pyotr Cherkasov, head of the Center of French Historical Research at the Russian Academy of Sciences’ Institute of History, the results of the voting have confirmed two earlier identified trends – the weakening of the position of the ruling Socialists, who have been unable to fulfill their pre-election promises, and the strengthening of the center-right bloc led by the UMP. “Sarkozy has restored his position not only within the party, but also in the political system. Who knows, maybe in two years’ time he will be able to do what nobody has been able to do since Charles de Gaulle – return to the Élysée Palace after a defeat,” said Cherkasov. The tabloid daily newspaper Moskovsky Komsolmolets continues to follow the development of the talks on Iran’s nuclear program now taking place in Lausanne, Switzerland. The publication reminds its readers that Tehran and the group of international mediators are discussing the parameters of an agreement which would become a basis for the lifting of part of the sanctions in return for Iran ceasing work on its nuclear program. The principal area of disagreement in the talks centers on the duration of a potential agreement. Meanwhile, the negotiations between Iran and the P5+1 group of six major powers (the U.S., Russia, China, the UK, and France, plus Germany)are causing mixed reactions among the countries of the Middle East — above all in Israel and Saudi Arabia.